SKI In - very easy for all ages. On a-well groomed private run off of mid peak 8. Ski Out - you can ski out to 8 lifts on peak 8 and ski school. Very easy our 4 year old does it! A Beautiful 9 Suite Corporate Ski in/out home above the base of Peak 8. Very Easy Ski Access to Ski lifts and Ski In. Option of skiing out to 8 Lifts. This Luxury Mountain Home is a Spacious 9 Suite Mini hotel! Very Easy ski In and Out. No Driving Required. 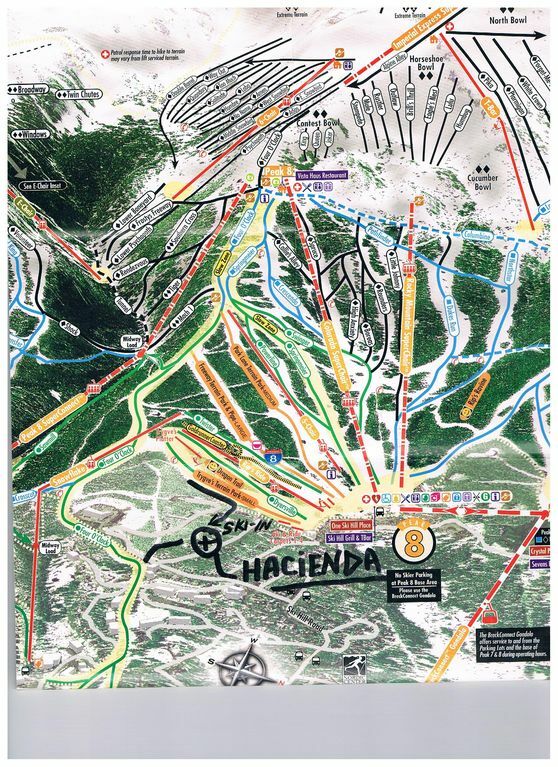 You can Easily get to Ski School, Main Lodge and all the Trails with Our center Mountain Location. Very easy return back to the house for hot tubing on the slopes. We have a large Ski room with foosball and tv for catching up on all the current conditions. Put your skis on and go! I plow and shovel each day and check the hot tub day to day. You can Really enjoy your vacation by having us do your shopping for you, just send a list of all your favorite food and drinks and we will make your check in super easy! I have lived here in town for 40 years and am available for any issues immediately. This home provides excellent access to all Summer activities. Mountain bike or hike right out the ski run. With A Large Parking Lot, we can handle all sizes of groups. We have a wonderful sand pit for games and children alike. Walk to town or take the fairy trail to one of our Treasured mountain Lakes. Each room has a full bath, TV, view or private deck/patio. oroginally from Colorado Springs started the vacation home venture in 1980. Have a couple homes in Breckenridge with three family generations here. We look forward to getting personally aquatinted and making your stay. Lots of parking, big kitchen, easy walk to ski, Very easy ski in. We have the easiest ski in on the mountain. ski down Four oclock and into our amazing ski room with leather couches and heated floor. You can ski right from our ski room when conditions exist to Snowflake lift or Gondola base. the Faster option is a short walk to Trgvye'S ski run and Ski to 6 lifts and Ski School. Super Easy! This is an amazing kitchen with 2 ovens, 5burner gas stove, micro, and plenty of room to spread out. Seating for 20. We have tvs in all of our rooms. board games, cards and chess. We have a very large sand play yard in the back of house next to ski run. Great for castles, or just enjoying the sun! We have a 6 person hot tub We check the condition of the water at least every other day, if not every day!. Beautiful Ski-in/out home with amazing views and location. It is possible to ski out to snowflake lift or Gondola. It is fastest to walk to Trygve's Run/small terrain park and ski down to peak 8 base area. Plenty of parking, walk to bus, great kitchen. Large bedrooms with TV and private bath. The 9th bedroom is a Queen bed in the second kitchen with private bath and a great room. I was in Breck with a group of guys for a long ski weekend. I can't say enough about the house. There are several rooms to gather, talk, play cards or watch TV. This is an amazing house. While we didn't cook, it had to have one of the best stocked kitchens I've seen for a rental. While we were there Breck recieved well over 30 inches of snow. Plows came through more than once a day to clean the driveway, and Patrick and Petra kept the decks clean. Ski in/ ski out is one of the easiest and most convenient I've experienced. A short run down to Snowflake starts the day, and an easy out off of 4 O'Clock wins it up. For a big crowd, this house is a can't miss. This house is perfect, especially for skiers! It's located right on the slope, with ski-in, ski-out access. It's very spacious with plenty of room to spread out. The house was very clean and had Christmas lights up and poinsettias set out for a homey touch. The property managers, Patrick and Petra, were amazing-totally available but never bothersome and completely willing to answer any questions. The house was stocked and supplied with everything we needed to function during our trip-all kitchen essentials, plenty of blankets, pillows, and towels, and even had games and toys for the kids! The only possible negative (although I don't really consider it a negative) is that the washer and dryer are TINY, especially for such a huge house-but who wants to do bunches laundry on their vacation anyway??? All in all, we had a wonderful time and thoroughly enjoyed our stay and felt completely at home at the Hacienda! This house is an excellent location for enjoying summer in the mountains. We hiked and biked right from the property and enjoyed the nearby reservoir (and fairy trail!) for swimming and fishing. The free gondola is literally a five minute walk from the property, which makes getting to town fun, free and easy. The alpine park with slides and zip lines are right by the gondola. If you are looking to get outdoors and enjoy Breck with a group, this is the perfect property. The house itself is clean, tastefully appointed and accommodates large groups well. The private bathrooms in each bedroom makes group living easy. The kitchen is fully stocked for group cooking and the top floor living space is large and open. The rooms were quiet at night and we couldn't hear people in the other bedrooms. It is important to note that this house is several stories and the communal space is on the top floor. We didn't mind at all but for people with difficulties on stairs it could be a challenge. Amazing home in the PERFECT location! 5 STARS! Hosted my company's annual retreat in Breckenridge in Jan 2018, our 10th. This house, by far is the best we have booked on VRBO. The rooms are well appointed, the house is huge with all amenities, but most importantly, YOU ARE LITERALLY 5 HOMES AWAY FROM THE PEAK 8 BASE! I did not realize you could stay in a private home so close to the base. The house is spotless, and was well setup for arrival. The owner was great and gave us good advice on the best way to ski back to the house (right into the backyard) at the end of the day. Perfect for our large group! Great property and amenities. The kitchen is amazing and the number of beds / baths were great for us! Best location for skiing ever. When they say ski-in/ski-out they mean it. We easily skied home for lunch each day. No fighting the crowds at the base since the neighborhood lift takes you straight to mid mtn. True 9 bdr/10 bath with plenty to room and well appointed kitchen that we cooked in to avoid holiday crowds in downtown Breckenridge. The owners, Patrick and Petra took very good care of us and even stocked the pantry and refrigerator with groceries for us since we didn't bother to even rent a car. This beautiful home is located on old four o'clock ski run. This is now a private groomed trail that only serves the 8 homes on our street. Skiing in is the easiest in Breckenridge. The other great item about this homes location is how far we are up the mountain. This means that you ski in less traffic to your home, and you can easily walk to the base and base area. The walk from our home to the base is closer than the walk from most homes in town to the bus, plus you do not have to wait!! All Fees are based on 18 people or less - No age Limit. Extra guests must be disclosed at/before check in. Extra guest fee must be paid at/before check in. Daily guests are discouraged. Excessive noise outside is not allowed. Quiet hours are 9 p.m. No Parking on the Street. You must follow our basic Check out procedure. Cleaning fee does not cover Extra cleaning Extra Clean up is $65/hour. Damages will be charged at replacement cost plus repair time. No Events OR Parties with out prior approval! All Outside venders must be pre approved. We do not allow animals. No Smoking I personally come by the home to check hot tub, shovel, and plow. We appreciate your business!